Cyclic voltammetry is a common technique for electrochemical analysis in which the potential at the working electrode is swept over a voltage range while the current is recorded. The Electrochemistry Module expands the possibilities in designing, understanding, and optimizing electrochemical systems through accurate simulation. This product offers significant benefit to researchers in the lab or to the industrial electrochemical engineer. Capabilities such as modeling electrochemical reaction mechanisms, mass transport, and current density distributions enable efficient simulation for applications including electrolysis, electrodialysis, electroanalysis, electrochemical sensors, and bioelectrochemistry. The Electrochemistry Module covers a wide range of applications involving electrochemical reactions. This is accomplished through interfaces for primary, secondary, and tertiary current distributions; electroanalysis; flow in free and porous media; heat transfer; heterogeneous and homogeneous chemical reactions; and material transport in dilute and concentrated solutions. Possible applications include the study and design of chlor-alkali and chlorate electrolysis, water electrolysis for hydrogen and oxygen production, waste water treatment, desalination of seawater, fundamental electrochemical studies in electrocatalysis and electroanalysis, and sensors for glucose, pH, hydrogen, and other gases. Secondary current distribution in a unit chlor-alkali cell. You can model the charge density in diffuse double layers without having to assume for charge neutrality by coupling Poisson's equation for the potential to the Nernst-Planck equations for ion transport. Nyquist plot for a range of frequencies and electrode kinetic heterogeneous rate constants. 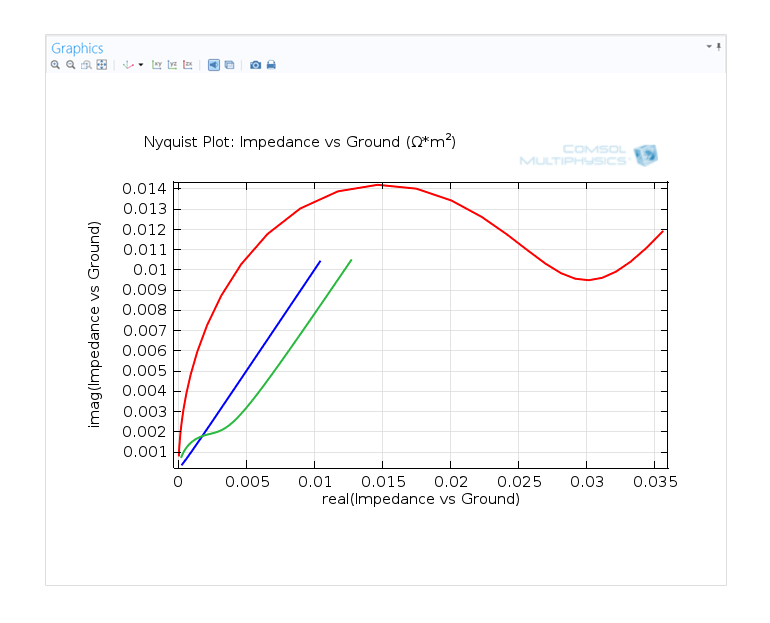 Dedicated features in the Electrochemistry Module enable the simulation of amperometry, potentiometry, electrochemical impedance, and coulometry studies, in addition to an interface provided specifically for cyclic voltammetry. Properties such as exchange current densities, charge transfer coefficients, specific active surface areas, diffusivities, and reaction mechanisms can be determined from combined experiment and simulation results. These can subsequently be used in industrial applications for accurate modeling and design optimization. Interfaces embedded in the Electrochemistry Module enable the modeling of systems assuming primary, secondary, or tertiary current distributions. The primary current distribution utilizes Ohm's Law together with a charge balance to model the flow of current in both the electrolyte and electrodes, while assuming that losses in electric potential due to the electrochemical reactions are negligible. The secondary current distribution includes these reaction-based losses and is modeled through interfaces for the Tafel and Butler-Volmer equations. These also support modifications and custom expressions. The interfaces include electric potential as part of the electrochemical reaction kinetics. In many reacting systems, and in close proximity to the electrodes, the concentration of the electrolyte is not constant. In that case, the effects of diffusion and convection have to be considered in addition to migration. 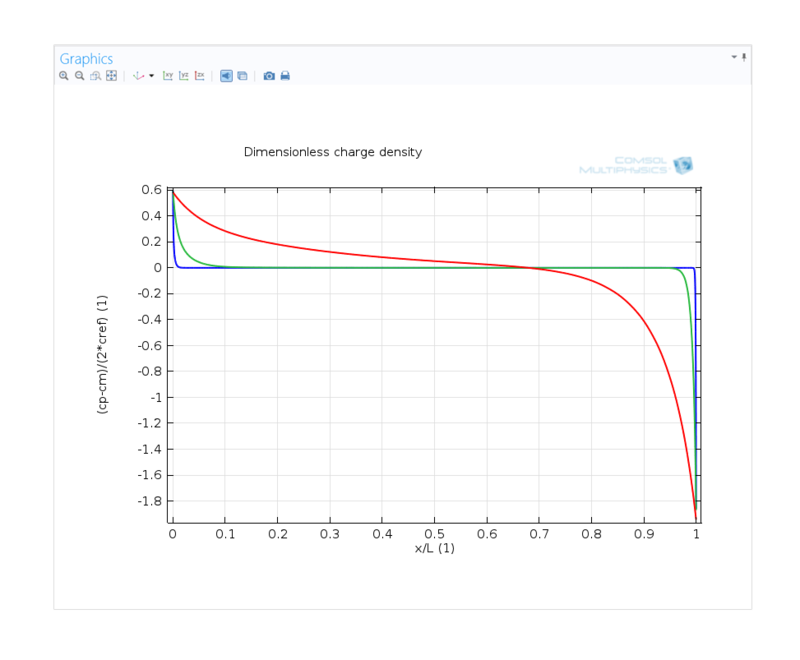 The Electrochemistry Module provides an interface for tertiary current distributions that utilizes the Nernst-Planck equation to describe the transport of chemical species in the electrolyte. 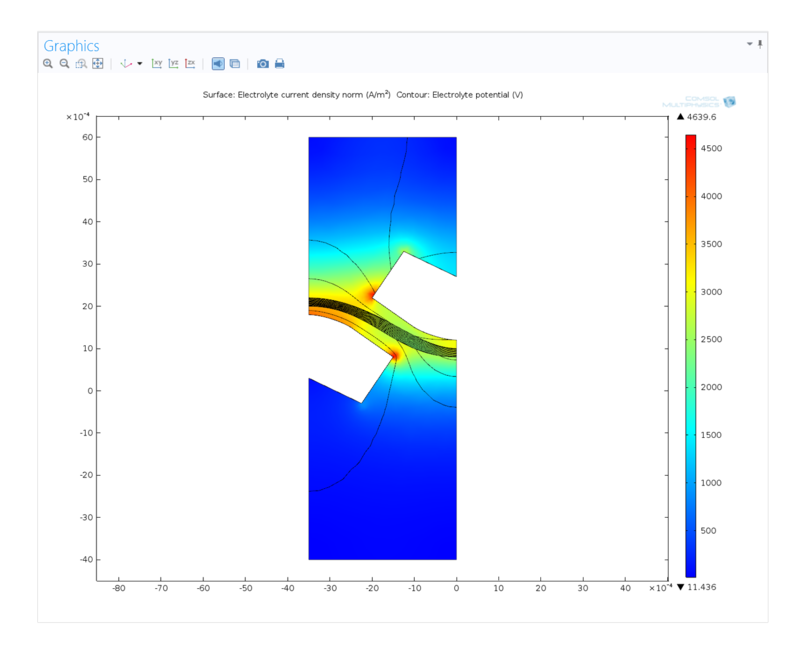 Utilizing the unparalleled capabilities in COMSOL Multiphysics, this interface can be seamlessly coupled to other interfaces that describe fluid flow and heat transfer.